As I write this, I’m sitting in the outpatient surgery waiting room at Rainbow Babies and Childrens Hospital. Annie is having her wisdom teeth removed today. It’s really a no-big-deal procedure that will result in some swelling and discomfort. I predict a lot of milkshakes and jello in her near future. As I glance around the room, I’m so impressed with the obvious planning that went into this space. Televisions are well-placed and the chairs are quite comfortable (they’re gliders, so I’m happily rocking while I blog!) Above me is a lighted image of the earth taken from outer space. In the adjacent room, computer games are installed on wall computers for young patients to enjoy. The bathroom is accessible and lockers are provided to store belongings under lock and key. The hospital staff, architects and interior designers worked together beautifully to make this a comfortable, inviting space. However, none of the “stuff” replaces the kind of care we have received. The parking attendant greeted us with a smile.The receptionist we met this morning was pleasant and helpful. The admissions secretary led us up to the surgery center so we wouldn’t get lost. The nurses and doctors weren’t in a hurry, and, with kind smiles and patient eyes, answered all of our questions. In short…it was a medical procedure wrapped in a thick, comfy blanket of hospitality. 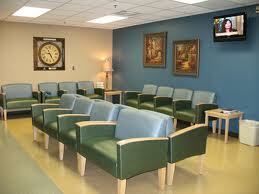 So, what can the church learn from the waiting room? Ministry begins as soon as the mini vans turn into the parking lot, and parking attendants are the church’s “first face.” Be certain that those who are serving in this capacity know that in addition to ensuring safety, they are promoting hospitality as well. Be certain that your ministry area is comfortable, clean, and appropriately lit. Purchase or create signage that helps newcomers to know where to go. Greeters should be on the lookout for visitors and anticipate their questions and needs. Good care ALWAYS trumps good “stuff.” Don’t worry if you can’t afford fancy computers, the latest sound system or the nicest furniture. The Church is NOT about pretty things.The “wow” factor that a slick, exciting space evokes is short-lived; the care provided by humble, loving staff and volunteers is lasting. THAT is what builds the Kingdom! This entry was posted in Managing Ministry, Working Together and tagged church, hospitality, ministry, special needs by katiewetherbee. Bookmark the permalink.